Deleted by accident - We could just be busy with something and work on cleaning up our messages when you delete something that you shouldn't have. Unknown error - It can happen as quickly as you can stop it, the list of reasons why sudden errors occur might be endless. Reformatting - Sometimes an Android phone just needs reformatting to get it back on track or to make it run better than ever. Broken phone - The user above sent in his or her smartphone for repairs and among the many likely superficial dinks and dents, there could be some damage to his or her data. Keep reading. 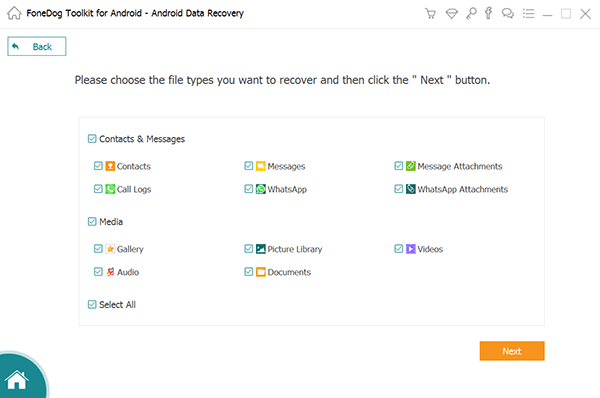 You can learn about how to recover Whatsapp deleted messages below. How to Fix Google Drive Does Not Sync Issue? 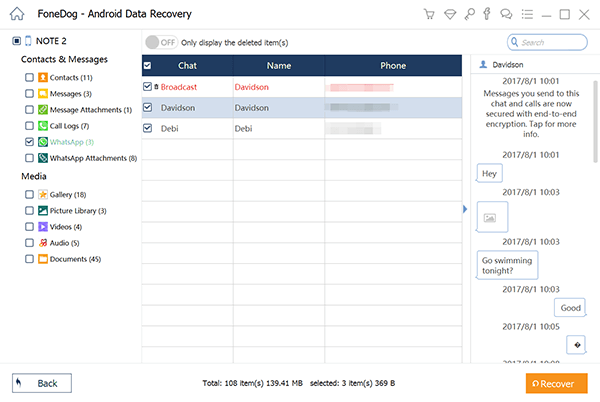 Fonedog Android Data Recovery is a program that can help you recover your data despite not having any backups. How? Well, when you delete or have something accidentally deleted from your phone, the file does not get removed from the phone, what we actually lose is the access to the file. The data then ends up floating around as if nothing happened and it aimlessly waits until the data space it is occupying is needed for more accessible data or unless a cleaning program forcibly deletes it altogether. Fonedog Android Data Recovery can help you get back access to those files unless the mentioned reasons they get deleted has already occurred. Download and install Fonedog Android Data Recovery to a computer or laptop. The same laptop or computer should be able to connect to your Android phone without any connectivity problems, otherwise, you may want to use another unit altogether. 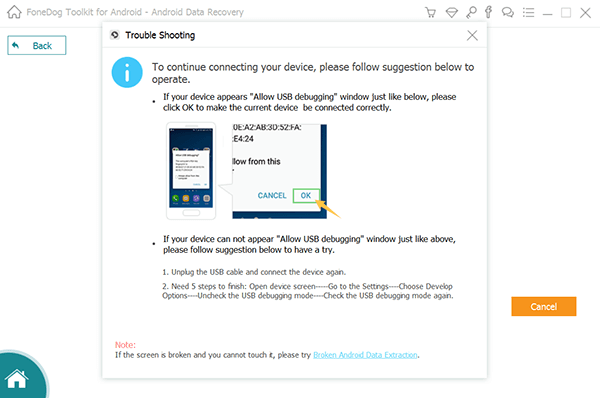 Run Fonedog Android Data Recovery and plug the Android unit using a USB cable. Please only use the same USB cable your Android phone came with or maybe use a cable that has been approved by your phone's brand. After plugging and detecting the Android phone, you will be asked to place the phone on "USB Debugging" mode, which allows Fonedog Android Data Recovery to scan through your phone's memory including the spaces that you do not have any access to. Please follow the steps to set the phone into "USB Debugging" mode and if by some chance you did not receive this prompt, it likely means that you've already placed your phone on that mode before and no longer have to do it. After setting the Android phone to "USB Debugging" mode, you now have the option to scan for various data. As you may notice, you can scan messages, contacts, call history and so much more. By now, you should have noticed the "Whatsapp" option that is the main reason you have installed Fonedog Android Data Recovery, please click on that box and proceed by pressing "Next." You can choose more than one option but that may affect the length of scanning time in step 4. After clicking "Next" Fonedog Android Data Recovery will start scanning through your Android mobile phone. Please note that the scanning process may take some time, this may take a few seconds or a few minutes, either way, please do not disconnect your phone while the scanning or you may experience some unnecessary errors, sudden disconnection also includes your phone switching off due to having no battery left. Kindly keep your phone at 20% minimum or if possible close to 100% to be safe. When the scanning is done, you will be brought to a screen where you can preview the information you wanted to recover. You can preview each entry and choose what you want to recover. Tick on the appropriate boxes and click on "Recover." Disconnect your phone properly and you are done. Now, this is the ideal option for those who have yet to back up his or her mobile phone and still need to recover some older Whatsapp messages, all thanks to Fonedog Android Data Recovery. And there you have it, if everything went well you should have the deleted messages. Please note though, that your backup will be overwritten every 2 AM, this is fairly standard so if you lost the data a few days ago, this might not be the ideal option for you. Thankfully, there are a few other options. Let us assume that when you got your Android phone, you did create or connect your existing Google account to the phone. This allows you to backup multiple things and set it aside for a later date, in fact, this is also possible for Whatsapp. There are a few more steps to this option but it can keep up to 7 days of your most recent data in its backup, any more and you'll need to go to Option 3. Simply follow the instructions and you shouldn't have too much trouble getting the information back, assuming you did switch on Google Drive. If you did not, please proceed to Option 3. Android phones are amazing gadgets and have pretty much changed our daily habits as quickly as we picked them up. Newspapers are a thing of the past, as most of us check our favorite sites for news nowadays and all in our handheld devices. Instead of texting or calling, our mobile phones use various applications to stay in touch with our friends and family. Among the countless apps that offer some of the most state-of-the-art messaging tools, Whatsapp continues to be a heavily favored application that most people use. In fact, you would be hard-pressed to find someone who owns a smartphone and does not have Whatsapp on his or her phone. That just goes to show you how popular the app really is. Whatsapp was launched in 2009 by former Yahoo! employees, free software that could send messages using multiple platforms such as Android and iOS, sending messages from smartphones to smartphones even to computers, the app was welcomed by many users as an alternative to text messaging and even email. Granting the capabilities of sending messages, pictures, videos and much more, it's a small wonder how Whatsapp continues to still be used on our phones to this day. Therefore, learn more about the ways of Whatsapp deleted messages recovery to help you have a better experience.